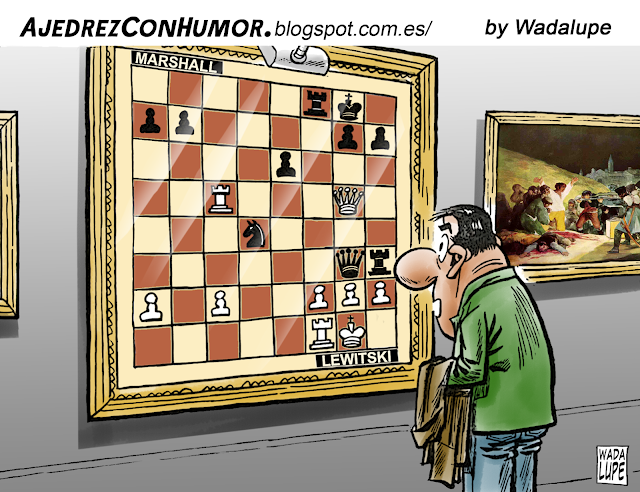 Chess and humour do go together. 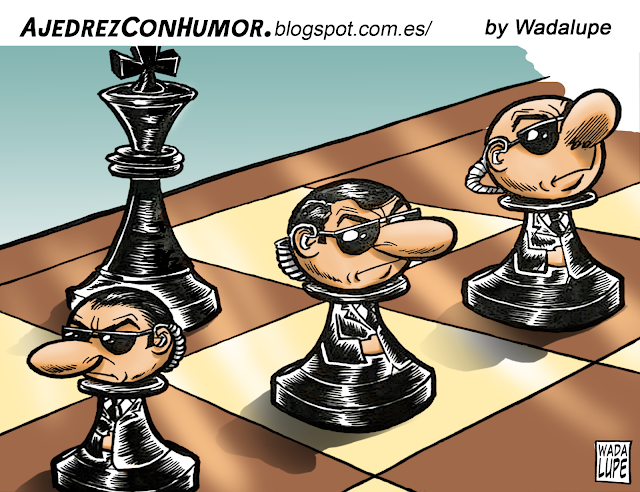 Andrés Guadalupe, a cartoonist and illustrator, has played chess ever since he can remember. 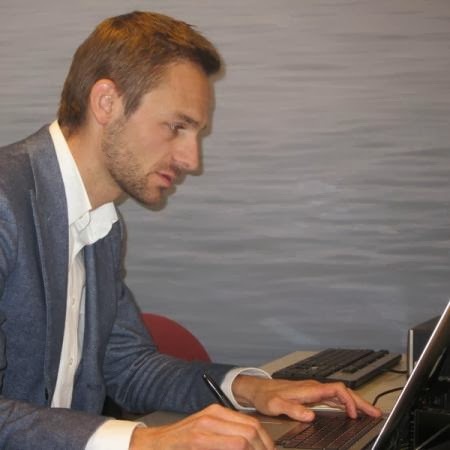 He has been a club player as well and has always, always been passionate about chess. 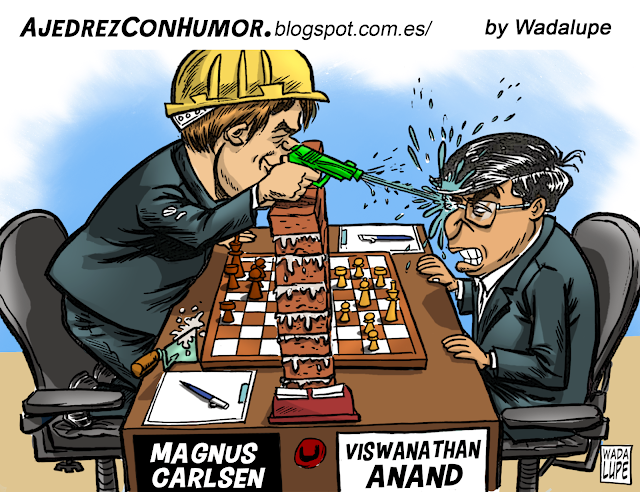 The Anand - Carlsen Chennai World Chess Championship 2013 is a special opportunity for him to explore his love for both chess and cartooning. 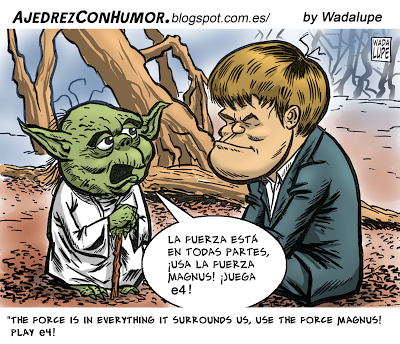 Of course, a cartoonist always sees what mere mortals cannot! "I've been making cartoons many years ago and not only chess, editorial cartoons, graphic humor in general, illustrations as well. Many subjects,' says Guadalupe, adding, "I'm doing chess cartoons regularly and now eventually doing a serial cartoons about the world chess championship." 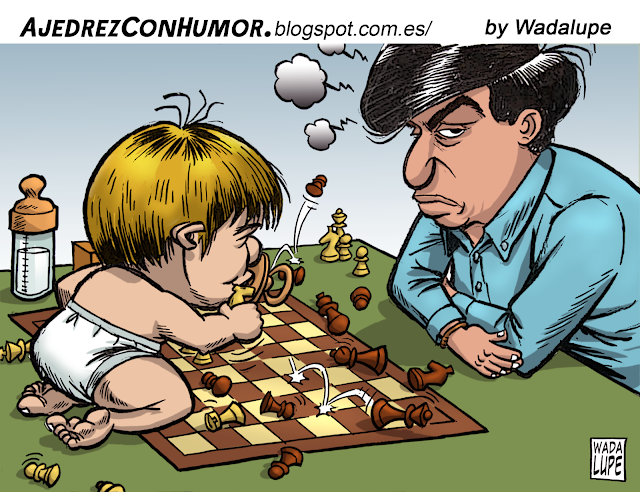 "My favorite cartoons always are the last, in this case the ones about the world chess championship." Guadalupe says, "My favorite player is Mikhail Tal. And finally my subjects apart from chess obviously, are editorial cartoons. My subjects are Everything. 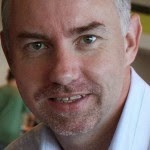 The life that surrounds me." Guadalupe begins with paper first, pencil and ink, then scans and puts in the text and coloring in Photoshop. He says, what a whole lot of us want to say all the time, "I would like that the chess was as popular as the football and other similar sports." Andres Guadalupe will soon be making an exclusive cartoon for us, so stay tuned. 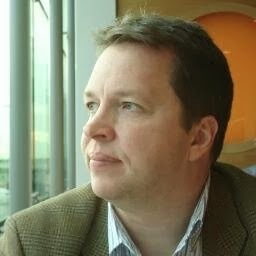 The excitement of the Carlsen versus Anand World Chess Championship has suddenly given way to dread. What happened to the excitement? Suddenly, the thought of either Viswanathan Anand or Magnus Carlsen losing is unbearable. It's breaking my heart. One is ice, the other is fire. One holds chess traditions aloft and the other brings hope of glorious human achievements even in the face of onslaught by machines. I cannot imagine either losing. 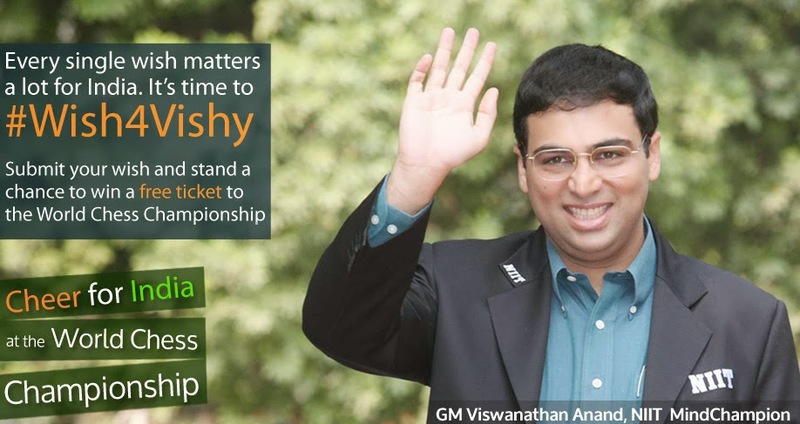 If Anand loses the title, I will spend the night tossing and many painful nights after that as well. 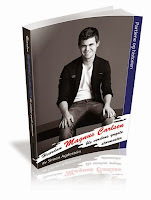 If Carlsen loses, the charm of the chess adventure will lose its sparkle... for a while at least. Is that because I belong neither to Norway or India? Would it be easier otherwise? Did chess fans ever find it so difficult to take sides? But this could not be about nationalities, or cold wars, or even about like-ability and definitely this cannot be just about comparing Anand and Carlsen's chess talent. So, whom do you support? How do you choose? There are no blacks and whites between Anand and Carlsen, just both in the same shades of grey. The online polls (on this site and around the world) consistently peg Carlsen as the would-be winner. The only time Anand led in the poll was when Carlsen drew his games with Hikaru Nakamura at the Sinquefield Chess Cup. 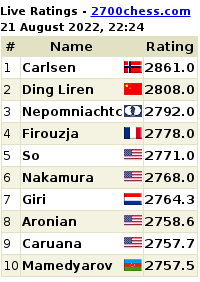 The poll curve bounced right back in Carlsen's favour once the World No. 1 wrapped off the title win in Saint Louis. Some Grandmasters do feel Anand could win, but this number is pretty small. Suddenly, everything feels so sadistic... like gladiators in violent confrontations entertaining a Roman audience? My friends tell me it's no big deal. This happens in sports all the time. Someone has to win, someone has to lose. They wouldn't know. This is not sport. This is chess. Anand and Carlsen are friendly with each other. In this rivalry, they have come even closer... and, it's breaking my heart. 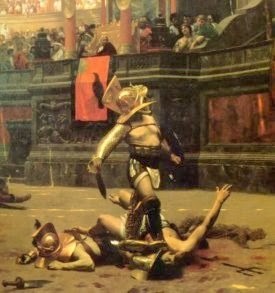 Like a Wiki description would say: Irrespective of their origin, gladiators offered spectators an example of Rome's martial ethics and, in fighting or dying well, they could inspire admiration and popular acclaim. 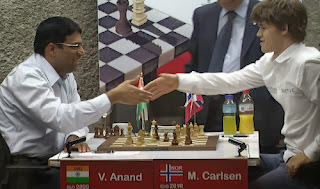 Salute to two of the finest chess gladiators of our times - Viswanathan Anand and Magnus Carlsen. 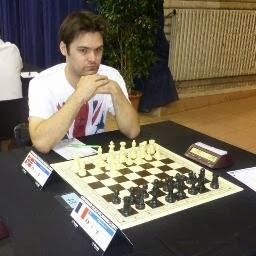 In fighting or losing well, they will both inspire chess lovers' admiration for all time to come.